A former police officer has been jailed for seven years at Mold Crown Court for leading the biggest mortgage fraud in north Wales, worth up to £24m. 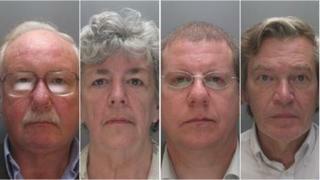 Antony Lowry-Huws, 65, from Kinmel Bay near Rhyl, was one of five convicted of duping lenders across north Wales. Developer Sheila Whalley, 67, from Llanfairtalhaiarn in the Conwy Valley was jailed for six years. Judge Rhys Rowlands said the fraud's scale was "breathtaking". The jail terms of four totalled 21 years. The trial resulted from Operation Valgus, reportedly the largest mortgage fraud investigated in England and Wales in terms of the number of mortgages involved. North Wales Police said the inquiry took five years and the scam was largest fraud ever to be investigated by the police force by a considerable margin in terms of value, complexity and substantiality. All five had denied conspiracy to defraud but were convicted following a four-month trial that ended in June. Co-conspirator Frank Edward Darlington, 62, from Barnoldswick in Lancashire, who acted as the surveyor in the transactions, was jailed four years, as was solicitor Nicholas John Jones, 54, from Mold. The fifth person, Susan Lowry-Huws, 60, was given a 12-month prison sentence suspended for two years with 300 hours unpaid work for her role, said to be on the periphery of the scam and under the influence of her husband. Both Antony Lowri-Huws and Whalley were disqualified from being company directors for 10 years. The jury had to consider 50,000 items of evidence relating to 189 mortgage applications made between May 2003 and June 2008. The prosecution said the deceit was achieved by inflating the actual value of the property used as security, hiding the fact that in some cases no deposit was put down, or inflating the rental income potential to make the mortgage rate more acceptable. In some cases the apartments on which mortgages were advanced simply did not exist. Judge Rowlands said the sentences were based on the £6m figure put forward by the defence, the difference between what lenders paid out and what they would have paid out if the applications were genuine. The prosecution put the value of the fraud at between £15m-£24m. More than 1,000 mortgages are being investigated by Operation Valgus. Following sentencing, North Wales Police Det Ch Insp Iestyn Davies said: "We welcome the sentences imposed today in relation this multi-million pound investigation which took five years of painstaking investigation to reach this successful conclusion. "Further individuals will face trial later this year in connection with the same investigation."